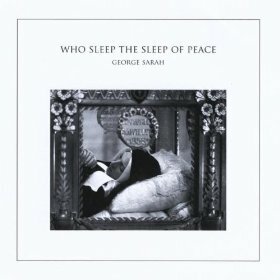 Pioneer for the fusion of electronica and classical since 1985, composer-turned-artist George Sarah continues to bridge the gap on Who Sleep The Sleep Of Peace. A whirl of synth drums, soaring violins, and the occasional forlorn female vocalist – this album does contain moments of genuine emotion & tragedy, however fruitless. We can truly feel his composer influence here, as the tracks fill spaces with sound, without making any significant or overt statement. Ironically, some of the more uniquely polished tracks could fit nicely in a film score of such epic proportions as Avatar or the Battlestar Gallactica miniseries. There is an apocalyptic sensibility that Sarah employs – initially affecting and sentimental, yet soon becoming overwrought, even indulgent. As a whole, this album provides a sterile backdrop for a nice Sunday afternoon brunch, or a nice car ride through some Roman ruins, but may not pull you in like an Explosions in the Sky record. collective albums, Sarah triumphs well here with “Anna”.